White fern or giant reed is a natural fencing material that has similar physical characteristics as bamboo reed. The color varies from yellow to brown with some green. 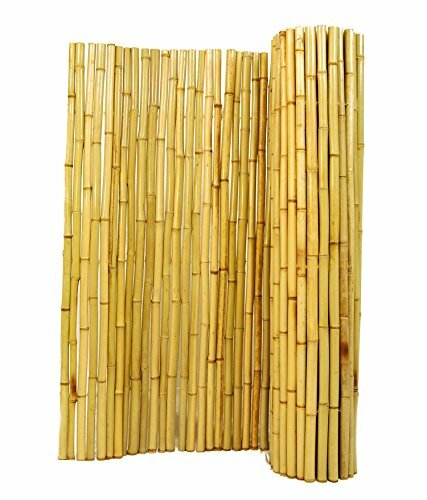 Unlike the hollow stems of bamboo reeds, they have a cork filled core and they are a lot stronger than the common reed fence widely available in other retailers. White fern sticks have a naturally occurring coat of wax that repels moisture and protects the poles from deteriorating. They can be used for wall coverings, ceilings and existing fences. Reed fencing is a convenient & cost effective way to add Texture & a dynamic aesthetic to your home & garden. This fencing is constructed from fresh water reed that grows abundantly along River banks, Wetlands, & estuaries. The pre-assembled panels are carefully woven together by vinyl coated wire to ensure durability while remaining seamless. This lightweight material is perfect for easily covering unsightly structures such as old fencing, or it can add a tropical aesthetic to your landscape or pool area. Using reed fencing as a screen can also aid in enhancing privacy for your home & garden. Using renewable resources is an excellent way to aid in preserving our environment, the abundant growth rate of fresh water reed makes it an eco-friendly option. Old-fashioned bamboo picket fences adds a traditional touch to a home, as well as to provide privacy and security. The wire between the poles are covered with sections of bamboo and the gaps between the poles allows for an open picket fence look. The spaced pole design of the picket fence allows a homeowner to see the property while also securing it. Our bamboo picket fence gives you another option to one of the most popular fence styles. These fences are built with 1 to 1.5 bamboo poles. Tonkin Bamboo culms are straight, thick walled with non-prominent nodes. They are the most durable of all bamboo species. They make excellent privacy bamboo fences with their naturally straight and compact form, making less porous fence screen. Tonkin bamboo last longer than other bamboo materials. These quality constructed bamboo fences are crack resistant and make excellent outdoor bamboo fencing. 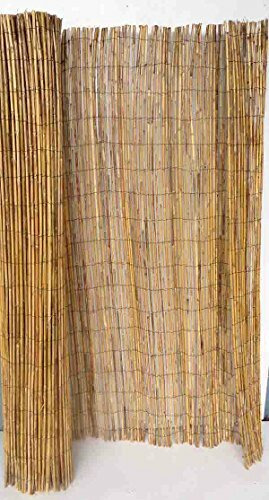 They are available in 4', 6' and 8' high in 6' long roll section.Use these bamboo fences in outdoor or indoor settings, as well as privacy fencing or screening in commercial premises or residential homes. 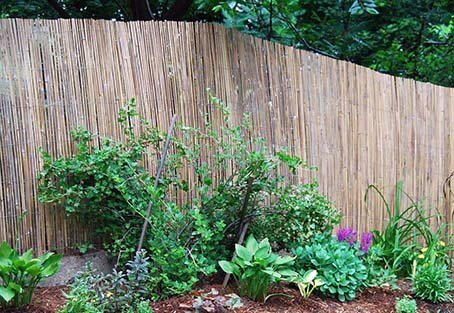 These bamboo fences come in rolled form, so they are flexible and easy to set up in tight spaces as well as on sloping, un-leveled landscape. Natural bamboo fencing is the most popular style of fencing currently out in the market. 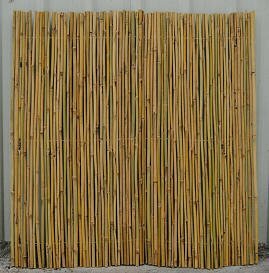 This is a classic natural bamboo fence where each bamboo pole is 3/4 inch in diameter and the fence panel is 6 feet high and 8 feet long. Each bamboo cane has its unique attributes that contribute to its natural appearance. 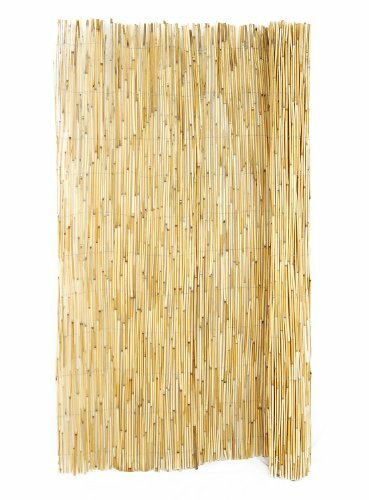 Our natural bamboo fencing comes in gorgeous hues of tan, yellow and beige. The colors are natural and have not been altered in any way. We crafted a quality and commercial grade Tonkin bamboo fence that will enhance the perimeters or border your home and commercial projects. Natural bamboo fencing is a great alternative to traditional wood fencing. It is easy to install. 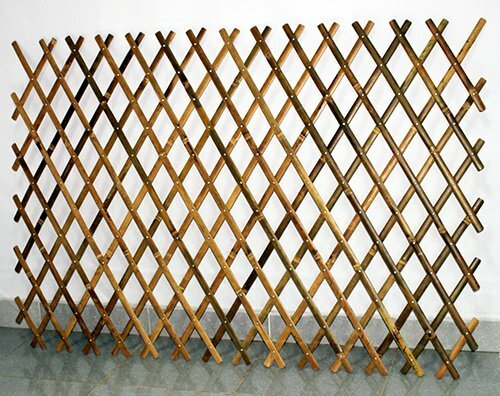 Our Tonkin bamboo fence can be attached to an existing fence or zip tied to a chain link fence. Our bamboo fences are hand-made from Tonkin bamboo imported from the Anji mountains in Asia with the finest workmanship. All our bamboo fences have high-grade galvanized wire inserted between each bamboo pole securing it to create a bamboo fence panel. Each bamboo pole has been individually cut at the nodes preventing moisture from entering and degrading the top of the poles. Our bamboo slat or split bamboo fences are woven together with black nylon coated wire, as oppose to other split bamboo slat fences in the market that usually tie their fences with bare metal wire exposing unsightly metal & rust. The fence is semi-opaque, which provide some privacy (not as much as a privacy fence). 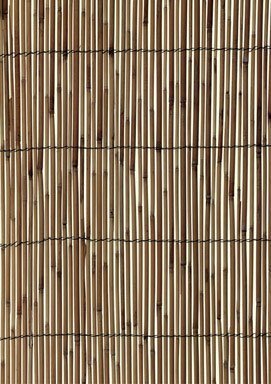 the unique color of the bamboo slats makes it one of the most gorgeous & striking, looking bamboo fences in the market today. The bamboo slats we use are about 1/2"wide. 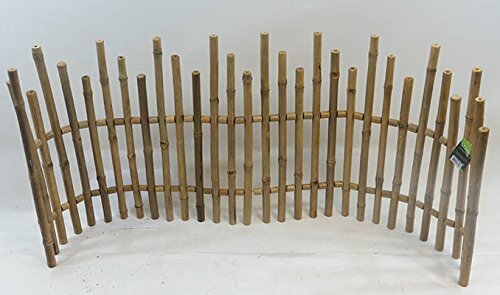 These bamboo expandable trellis fences are flexible and can function as trellises, fences, gates, border dividers, or for decorative purposes. They are perfect for training climbing vines and vegetables, supporting tomatoes and more. Place them vertically or horizontally for various uses in the garden. 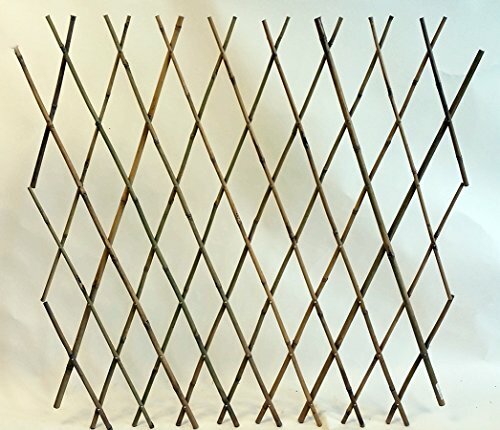 Expandable Bamboo Poles Trellis with aluminum rivets, 48"
These economy bamboo poles expandable trellis fences are flexible and can function as trellises, fences, gates, border dividers, or for decorative purposes. On a wall, or as a fence this lightweight bamboo trellis expands to fill any need! A wonderful way to train plants to cover a bare wall. Place them vertically or horizontally for various uses in the garden. Excellent for the indoors as a divider or gate for pets. Use them in outdoors as a trellis fence or garden decoration. The height is 48 inches when extended to 72 inches wide. The bamboo poles used are 3/4 inches diameter. Gardman R644 Reed Fencing. This 100% natural reed fencing makes an ideal cover for unsightly areas or to enhance gardens, yards, and decks. Its natural look will blend with any setting. Use as boundary fencing or as screening to create areas within gardens. Use over arbors and pergolas to softly filter sunlight creating a shaded area underneath. Ideal for Japanese gardens. Durable and easy to install; simply attach to fence uprights with ties or staples. Banded with galvanized wire for durability. Dimensions: 13' Long x 3 ' 3" High. **Also available in two other heights (sold separately): 5' model R645, and 6' 6" (R668). Gardman "Bring your garden to life"
This is about as simple as fence installations go. We wired an 8 ft. Bamboo Friendly Fence directly to an old chain link to add privacy and style to this backyard. Fence panels available at http://www.bamboofencer.com. 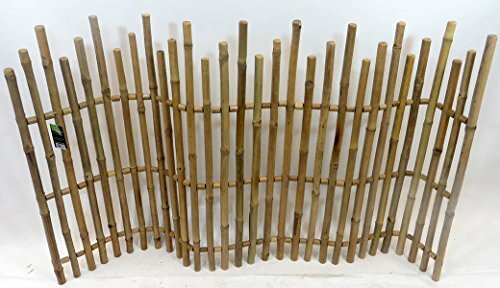 Compare prices on Garden Bamboo Fence at ShoppinGent.com – use promo codes and coupons for best offers and deals. Start smart buying with ShoppinGent.com right now and choose your golden price on every purchase.